Cutworms are caterpillars of Noctuid moths that feed on a wide variety of cultivated crops, including strawberries, and a number of weeds. The most common cutworm species in North Carolina is the black cutworm (Agrotis ipsilon). Cutworms follow the typical moth life cycle. Eggs are laid by females on suitable host plants that hatch into caterpillars. When mature, the caterpillars pupate in the soil and emerge as moths. 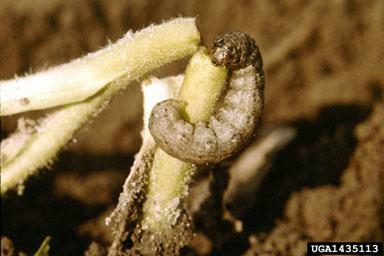 Cutworms can have two to four generations per year, and overwinter as pupae or mature caterpillars. Cutworm larva clipping young tobacco plant. In strawberries, petioles will be clipped near the soil surface. Larvae may hide under plastic in annual production. Cutworms are more problematic in matted-row strawberry production systems than the plasticulture strawberries, which predominate in North Carolina. When damage does occur, it usually occurs in localized clusters of plants surrounding each cutworm with areas of undamaged plants in between. Damage is most common in the fall following transplant. Cutworms feed on both the leaves and stems of strawberry plants, usually close to the soil surface. Leaf feeding results in irregular-shaped holes and usually does not result in yield reduction. However, stem feeding can significantly reduce the size of the strawberry crown and the plant's subsequent yield. As cutworms are primarily nocturnal, much of the feeding damage occurs overnight. Soil fumigation and soil preparation that are commonly performed in annual grown strawberries eliminate the majority of cutworms. However, they sometimes migrate into strawberry fields from adjacent areas. As many weeds also provide food for cutworms, good weed control practices help to reduced cutworm populations. If cultural methods fail to control cutworms, spot treatments of foliar-applied insecticides or baits can be applied. Refer to the North Carolina Agricultural Chemicals Manual for materials recommended for use against cutworms in North Carolina and the Southern Region Small Fruit Consortium Strawberry IPM Guide for regional recommendations. OMRI-approved foliar-applied materials are available. Refer to the North Carolina Agricultural Chemicals Manual for materials recommended for use against cutworms in North Carolina and the Southern Region Small Fruit Consortium Strawberry IPM Guide for regional recommendations.